The ProForm ZR3 recumbent bike is big on entertainment featuring a touch screen for game play, a plug-in for any Mp3 player, and even an iFit™ card slot to expand the number of workouts available. However, at $399, Proform should have spent more effort building a better bike than focusing on frills. 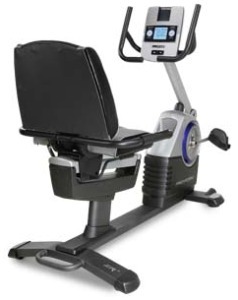 The ProForm ZR3 recumbent bike has a high-resolution blue Grafixx™ LCD display that shows your workout readouts and the Touch Screen display lets you work the installed GameFit™ fitness games including Black Jack, Texas Hold 'Em, Fat Blocker™ or Calorie Destroyer™. They are integrated with the tension system in that, the harder you exercise (pedal), the easier the game becomes. * Workout cards sold separately. UPDATE: The ProForm ZR3 has been discontinued and is no longer being sold. You can check out the latest exercise bike lineup at the official ProForm site to compare the new models. The ProForm ZR3 recumbent bike with its comfy, oversized, adjustable seat and fun game-playing feature will be a great bike someday – when ProForm builds it using quality parts. While it is a very attractive design, with easy entry, and an ideal entertainment design to pass the time, they cut too many corners using cheap parts, hence, the 90-day warranty which is one of the shortest in the business. Also, ProForm don’t include a power cord so the bike’s display is battery-operated. You will spend a lot of money replacing batteries every three weeks, even if you have no other issues with the ZR3. Reviews on the Proform ZR3 range from favorable to passable to furious. Most new owners are relieved to get past the tricky assembly of the console on the mast, which is unnecessarily complicated. The wires and harnesses are fed through the tube to connect them to the display, making this recumbent bike very time-consuming to put together. Once assembled, the ZR3 recumbent bike will then last for a few weeks or months until it breaks down. Once the tension goes and it stops changing resistance, it is no longer an exercise bike, but a problem that you will have to deal with when you call ProForm – a company notorious for bad customer service. Do not buy this bike. Too many users have reported that the display quits working after a couple of months (even with fresh batteries), which explains why the parts/labor warranty only covers the first 90 days. It may also indicate that these display issues have something to do with the wiring having to be fished, crammed, jammed, and clumsily fed through the tube to reach the console. There’s bound to be crimping in those wires, plus, the computer board and the tension system just aren’t worth a darn. Skip the Proform ZR3 recumbent bike and review the Schwinn exercise bikes at this price level. They are best-sellers for a reason.